I had a chat with a wealth management advisor from a well-known financial institution, who was bullish on short duration bond funds due to “the FED’s complete control with regards to suppressing and maintaining short-term interest rates.” I was wondering if you had any articles on what factors (other than the FED, if any) contribute to and continue to suppress short-term interest rates in the US and what potential facts could reverse this trend? The Fed exerts a great deal of control over nominal interest rates. While the Treasury and Fed maintain the pretensions of an open and transparent market where national and international demand for government securities is generated organically, the reality is that the Fed can monetise anything that the market rejects to achieve any desired nominal interest rate. This applies equally to all securities; though the Fed allows the 10-year and 20-year to float more freely, Operation Twist shows the Fed can control the nominal yield curve if they so wish. What the Fed cannot really control is the rate of inflation, the other variable that makes the real interest rate, and the key variable in determining whether Treasuries are a winning or losing bet. On computing the graph, my jaw almost hit the floor; real interest rates on the 2-year today are higher than they averaged during the boom years up to 2007. The Negative-Interest-Rate-Policy isn’t so new at all. All the Fed’s accommodative action has been almost meaningless — it has hardly reduced the real interest rate at all from the pre-crisis norm (although the most recent spike into positive real territory is the strongest argument for imminent quantitative easing that I have seen in a long time). But this doesn’t prove that the Fed can really exert control over real rates. However the graph suggests very strongly that Greenspan took his eye off the ball in terms of real interest rates; as real rates continued to fall, Greenspan wasn’t raising nominal rates, as might be expected of a Fed chairman looking to prevent bubble-formation. Simply, the idea that short-duration bond funds are a good bet due to “the FED’s complete control with regards to suppressing and maintaining short-term interest rates” is completely wrong on every level; they’ve been a losing investment in real terms for most of the last 5 years, and the Fed is determined to keep it that way. The Fed’s control over nominal interest rates is precisely the reason that I wouldn’t want to invest in treasuries; not only has it continually made bonds into a real losing proposition, the only things that would turn bonds into a winning proposition — rising interest rates, or deflation — are anathema to the Fed, and explicitly opposed by every dimension of current Fed policy. This entry was posted in Economic History, Economics, Federal Reserve, Inflation, Wall Street and tagged operation twist, quantitative easing. Bookmark the permalink. Interest rates are a measure of the scarcity of money. In a way, they are the cost of money. Not enough money, high rates. Too much money, low rates. So by that logic, the nominal rates now ARE the interest rates – since the Fed controls the quantity/supply of money. If money supply were limited somehow, i’d agree that there would be “real” rates, but in this system, any method you may use to try and calculate ‘real’ rates is kind of pointless. Interest rates measure the cost of money, the fed controls the supply of money, so the fed controls the rates. The fed can very easily flatten any curve it wants if it wishes to. so comparing short/long term treasuries is somewhat pointless in my opinion. This entire fiat money system is just too stupid to make sense. The very idea of money is linked to some kind of scarcity – and then you have this group of people controlling the scarcity…. the amount of power they yield is staggering beyond my limited comprehensive abilities. I know you’re going to bring up inflation, so let’s talk about that too – inflation is something that this group has somewhat less of a control of – so in a way inflation may be used to set a standard for calculating “real” rates. BUT, who really believes the inflation figures as reported by the authorities today? So what inflation figure would you use to measure real rates? Core? CPI-U? Shadowstats? Too complex. Assuming long term treasury rates show “the expectation investors have of long term inflation trends” is ridiculous. It may have been true in a gold standard, but that isn’t true today. Nope. We’re talking about the interest rate on treasuries. To see what treasuries are really yielding, one must look at the yield graded against inflation. This applies in any system I can think of, even ones with central banks, even on cash or money markets. You have to factor in inflation, otherwise it’s a meaningless figure. We can argue and argue about which inflation figure to use, I suppose. I’m just using CPI-U, mainly because that is what everyone else is using. Shadowstats would show the same pattern, just at a lower real rate of interest. Actually, they have been a winning investment. Nobody actually waits nowadays to be paid the interest and principal at the expiry time. If traded, on a DV01 basis they have been even more profitable than gold as of late. Of course, these are the Fed’s stated intentions. To make you go out and look for riskier investments to spur the animal spirits. The problem is that as per my above, people have been drawn to the treasuries because of the Fed making the more profitable by suppressing the yields (most investors now trade products like TLT with the treasuries as the underlying, as you can see at Google Finance, quite profitable). And I’m not sure how to interpret the jaw dropping graph. First of all, it appears that it’s actually representing a MoM % change, and second of all, with inflation high, the real interest rates should have been below 0, not at 5% (as it appears it is interpreted). I discussed this with Jim Rickards on Twitter. You’re just passing off a losing investment to a bigger sucker. That’s not sustainable, but yes I suppose it is (at least in the short term) profitable. Yeah, it’s funny. The Fed, in suppressing bond yields, has made bonds more attractive. I would do an article on it, but it’s too short and sweet a point. And again, it’s just profiting from bigger suckers. It’s representing the real rate, yield minus inflation. 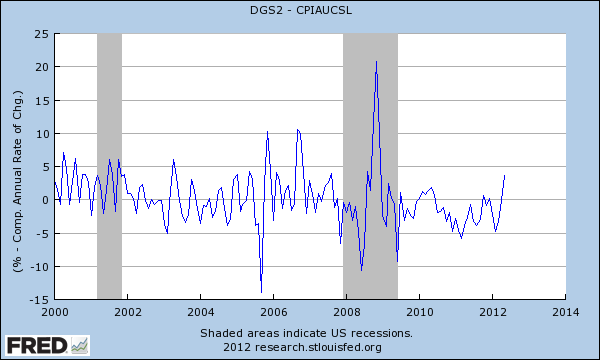 The reason you see the rise is that MoM has gone deflationary, at least as measured by CPI. Certainly it has fallen to the lowest point in the post-recessionary environment, even by the (much higher) Shadowstats data. Whether this is an oil blip is another debate. Benny said last year the elevated inflation was “transitory”, but I am not so sure central bankers will ever see deflation as “transitory”. 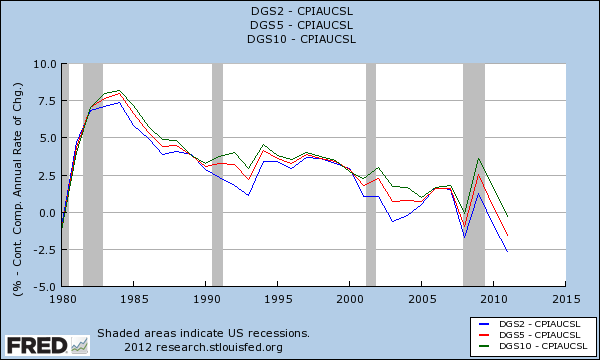 If people are looking for evidence of imminent QE3, this is it. Yep, the Fed blew a bubble in treasuries. Just like it blew a bubble in housing. It won’t end well in the aggregate. Those who are lucky enough (or inside enough) to time it right may make money, but more people will lose. That’s what our economy has been for the last 40 years – clever games to find suckers rather than actual capital investment that works or doesn’t on its own merits. There’s a 5-letter word for that which starts with a ‘P’ and end rhymes with ‘Fonzie’. Considering that all the variables are [manipulated, fixed, lied about, fraudulently posted, etc], and taking into account that nobody trusts any governments/corporations accounting methods, it would seem that attempting to come up with any kind of figures would be mere folly. Instead, consider seeking out reality, such as prices paid on a micro-level, and credit destruction on a macro-level. Since all asset-values mean nothing in an economic system which used counterfeit and/or abstract money, what’s the difference? More important is notion that interest is charged/accrued in the first place. Get rid of the idea that you can receive, “something for nothing,” and many economic dilemmas vanish simultaneously. Per “Roberts (no — not Chief Justice!) Rules of Order”, I rise on a point of clarification*: On the next-to-last line of your post of July 04 @ 18:12:13, did you not mean to write “ever see INflation”, rather than “DEflation” as posted? * I am not qualified to join the substance of the deliberations. But I, and others, need to learn. No. I’m just going on Bernanke’s track record: an inflation spike last year is written off as “transitory”, yet a similar commodity-driven deflation slump this year is much more likely to be a trigger for QE3. Central bankers hate deflation, but love inflation. Aziz, you have to keep in mind that commodity inflation can, and often seems to be, speculatively influenced. Consider oil prices; what could possible justify them at this level [viewing the fundamentals]? And I would disagree with you that Central Bankers love/hate inflation/deflation. In their ideal world, I believe that anyway they can rig the system to deliver a higher degree of financialization [as they have so successfully done this cycle] is what their goal would be. Sometimes this would involve inflation, sometimes deflation. After all, is their any better time to buy assets then after a deflationary depression? And, as a matter of pure speculation, I believe the next generation of billionaires will soon be getting stepping up to the plate. It’s going to be like Babe Ruth against little league pitching. Of course it can be speculatively influenced. I think most of what we saw last year was speculatively influenced. At the same time, I don’t think that this year’s commodity-driven slump is anything to panic about either. 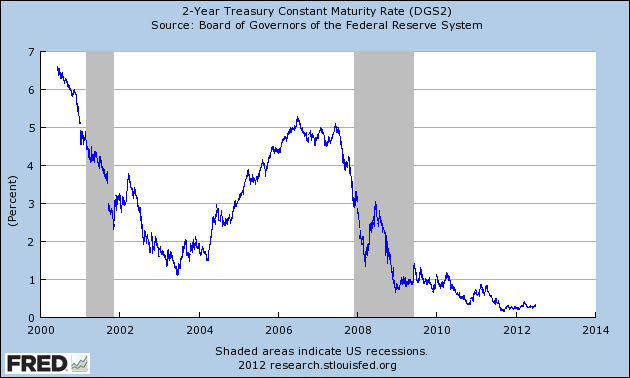 Doesn’t stop the Keynesian side of the blogosphere going wild with “QE3 now!! !” rhetoric. As for your point about central bankers, not many central bankers are actually rentiers themselves. At least today most of them are stuffy academics raised on Keynes and Irving Fisher and paranoid about debt-deflation. The only semi-exceptions to this rule I can think of are the ECB and Japan. But these are very much semi-exceptions — both the ECB and Japan have engaged in accommodative policy to stave off debt-deflation. Yes, and we’ve seen how successful the Japanese have been over the past two decades!! Bankers, like bookies, essentially play the middle, although inflating assets/selling at the top, and deflating/buying at the bottom, is always great fun and quite profitable, but, of course, their main interest has always been interest, i.e., getting a cut of the action [financialization] no matter the x-flationary winds. Japan is a very strange case of non-liquidationary cycles of reflation and deflation, which I figure is where the West is headed to. What I call zombification. Which is of course rife with financialisation. IMPERMANENCE re oil prices: What “fundamentals” tell you that oil prices are not justified? The cost of reserve replacement (future production) is surely going up — a LOT. Ask the most aggressive capitalistic nation — China. Near-term: OPEC’s mostly-irrelevant and unenforceable quotas are largely ignored. Renewables are uncompetitive, and coal is unpopular and expensive to transport. Natural gas is land-bound pending a LOT more LNG investment, and is unsuitable for many markets, especially until CNG expands. If you know how to produce oil cheaper, let’s form an oil exploration and production company! DG, there’s a massive glut of oil out there. Demand is back to 1990’s levels. The price of oil, just like all other markets, is enormously manipulated. Who knows what a bbl. of oil really cost to bring to market any more? For that matter, who the hell knows what anything really costs anymore? When the rate of inflation in house prices exceeds the CPI, and housing rates do not take into account the real rate of inflation, then this is deliberate money printing to benefit speculators in the asset prices rising. The savers are not being compensated, for the loss in purchasing power, so there is institutional theft from the middle class to the well connected bankers and their closest clients and friends. I wrote to the Australian Bureau of Statistics about this back in early 2000 and the Reserve Bank. I got a standard letter about it being international practice bla bla blah. This was worldwide theft. Not only LIBOR cheats but the FED and other Central Banks have artificially kept rates lower than what they should have. This has disadvantaged honest hardworking savers, especially pensioners who have been forced to invest in a fluctuating stock market to keep up. Add a stockmarket plunge to the mix and how many people have been burnt who had a panic attack and sold out at the march lows. No wonder why we get inaccurate statistics, interest rates and lies from Politicians. The people don’t care. A dead Hollywood actor trumps the discovery of the Higgs Boson. Widespread ignorance is nothing new, though. Agreed. That is why we’ll always worship a higher spiritual being. It must be a humbling experience for Kim Kardashian followers. So in other words, humbleness = religion = something that must be ridiculed? Not that I agree with impermanence, I’d say that knowing a priori that you cannot know something (if specific, i.e. more than complete generalization) is not very epistemologically sound or humble.